Click Here to see Hundesports Facebook Page!! Welcome to Hundesport Alaska, Inc. This site was created to inform the public about a Dog Sport that was created as a breed suitability test for the German Shepherd Dog and is still used for that purpose today around the world. Some of the other breeds that have the abilities to compete in the sport are the Rottweiler, Doberman Pinscher, Bouvier, Giant Schnauzer, Boxer, and Belgium Malinios-Terv. -Sheepdog. IPO (Working Dog Title) is the most complete form of training ever devised for the working dog. The IPO (Working Dog Title) is geared toward the development of a working dog's natural character. What is the history of Schutzhund? The first Schutzhund trial was held in 1901 to emphasize the correct working temperament and ability in the German Shepherd breed. Today, Schutzhund is a fast growing, competitive sport, and is used as a hobby and recreation throughout the U.S and many other countries. The levels of competition increase in difficulty from the first title, Schutzhund I, through the II and III levels, and the training abilities of the dogs are proved with the achievement of each title. What breeds of dogs are used for the Sport? Working breeds are seen most often in the Sport, such as German Shepherd, Rottweilers, and Dobermans, but a variety of other breeds are also used. You can find Belgian Malinois, Australian Shepherds, Boxers, Bouviers, Mastaffs, as well as a variety of mixed breeds involved in the Sport. What is the ideal Schutzhund dog? The proper dog for this training has a stable temperament, is athletic and structurally correct. The work is very demanding, both physically and mentally, and the dog that is not stable will not have the temperament and drive necessary. Schutzhund dogs are self-confident and assured, and are not aggressive. They display a close working relationship with their handler, and are eager to learn. They enjoy the mental stimulation the learning experience offers and are the happiest when working as a team with their handler. How long does it take to train a dog for the Sport? The time required varies from dog to dog, and from trainer to trainer. Factors to take into account include the dog's age and experience, and the breed involved. Some learn quickly and others take longer. The Sport requires dedication and commitment, and cannot be entered into in a haphazard manner. Do the dogs really enjoy the Sport of Schutzhund? If trained in the right manner, the answer is a definite yes! The dogs are eager, tails wagging and ready to go! Just watch a dog and handler team in action. My dog lacks self-confidence. Would Schutzhund training help? Absolutely. In all three phases of this work we are teaching the dog a new game, a game he can win. We can increase the game's difficulty over time, giving him greater and greater wins. With each win comes an increase in his self-confidence. This self-confident dog becomes more stable and secure in all other aspects of his life. No puppy that has completed his puppy shots is too young. The training at this stage consists of imprinting and building self-confidence. A mature dog which has been trained in any other way usually learns the Sport quickly. More important than age to take into consideration is the dog's mental and physical condition. The English translation of Hundesport is "Dog Sport." Hundesport Alaska is a local group of people dedicated to the training of working dogs for the Sport of Schutzhund. We also support dogs for police work and search and rescue dogs. 2009 Hundesport Alaska State Fair Demo! 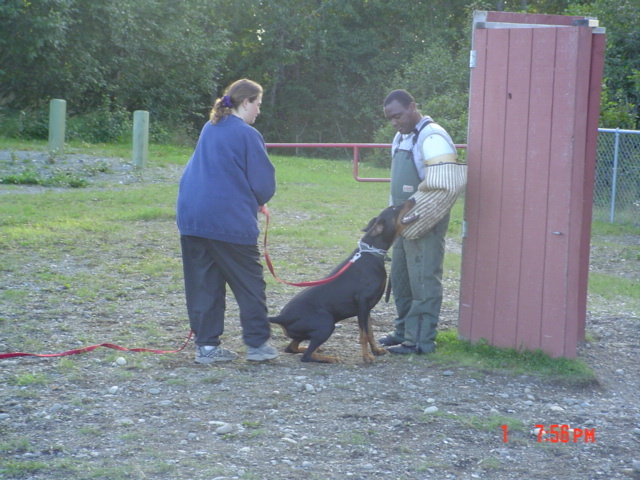 Our President from 2003 to 2007 Kathy and her Doberman Raven working with Khalid.